Happy Friday! I swear every time I think I have all my ducks in a row, something happens to derail even the most well-made plans. Does that ever happen to you? I’d like to think I’m not the only one. This week has been filled with layers of challenges that only compounded as the week went by. But you know the most important part of dealing with those challenges? It’s finding a way to deal with them and face them head on so that they do not stop you from moving forward. So, that’s exactly what I did. How do you deal with challenges when you least expect them? I’d love to know! Alright, let’s talk fashion and travel! I have been working on plans to return to Cape Cod this summer, and it’s always makes for an exciting time when making travel plans. Cape Cod is such a quaint and beautiful part of Massachusetts, and every year we enjoy finding new parts of the Cape to explore. Check out my post here and here from our visit last year! And while I am still trying to find some spring weather to dress for outside my door (Mr. E jokes the poles have shifted! 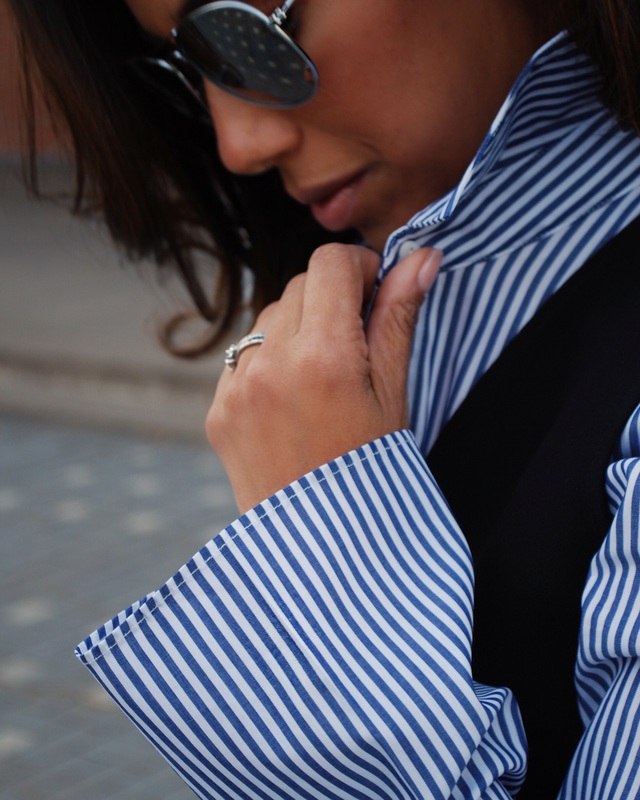 ), I’ve been exploring wearing layers on my petite 5′ frame. Now, I don’t think I’ve worn a crop top since the 90’s (I’ll have to double check on that! ), but the only way I’m comfortable wearing them at this point is in layers! Ha! I enjoyed finding this black cropped shell top because it is a great basic piece to have for all seasons. I can layer this over a button down as I did here for work, or over a turtleneck in the winter, or even on a longer tank top in the summer. So it’s definitely an investment piece (this one was under $30!) to have in your closet. The funny part of the layering the black crop with the bell sleeve top is that it was also a cropped top. 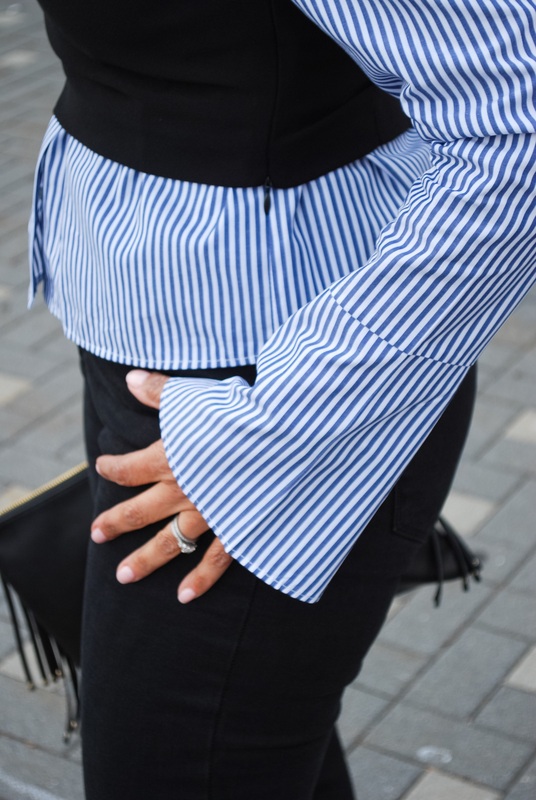 However, when I put them together, it gave me a bit of length in my torso, and the striped bell sleeves gave me length in the arms! It does help that I am wearing high waisted jeans (a shape I’m currently loving!). It’s something about that extra cinch! Ha! 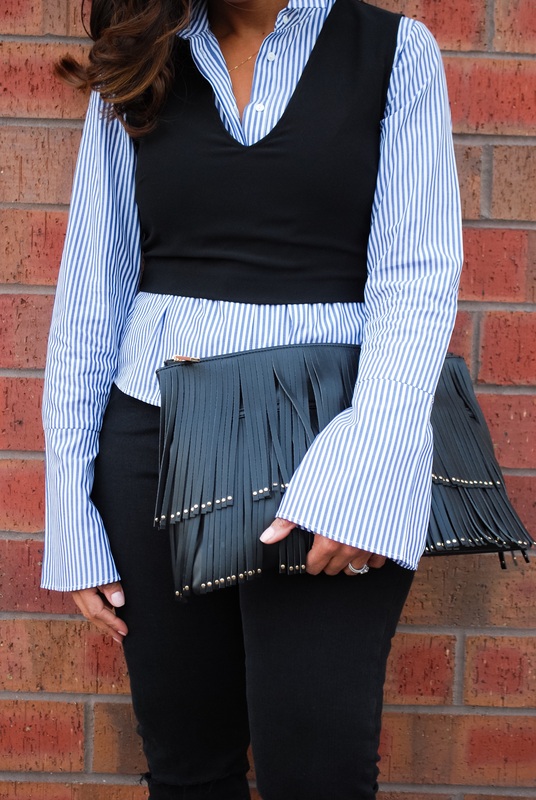 I wanted to play with structure of the lines in the look, and so the layers of fringe on the clutch reflected the stripes in the blouse to give the outfit some edge. Wearing open sandals was my way of defying the cool spring weather and keep it basic. Thank you for stopping by! And if you haven’t seen my new Currently Shopping For page, I’d love for you to stop by and check it out. In a hurry? I’ve posted my favorite spring finds right in the side bar! Enjoy! Stay golden! LOVE this outfit!! That clutch is adorable and I love that blouse!